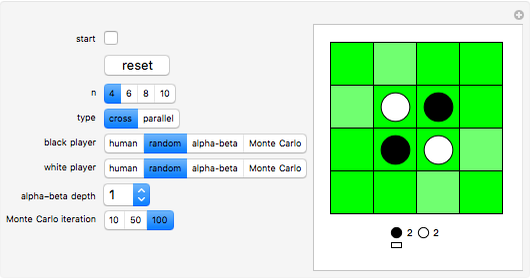 In the game of Reversi, each piece has a black side and a white side. As black, say, you can place a black piece by clicking next to a white piece or line of white pieces (horizontal, vertical, or diagonal), so long as there is a black piece on the other side. All white pieces sandwiched between two black pieces then flip to black. You win by covering the entire board with pieces of your color. 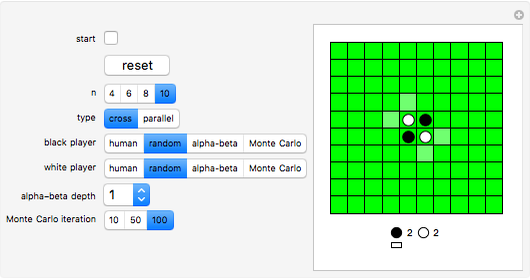 One side can be played by the machine using two algorithms: the alpha-beta algorithm or a Monte Carlo algorithm. Also, a machine player can be set to choose moves randomly, or two human players can play. 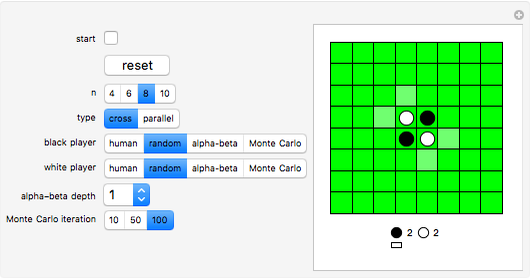 The alpha-beta depth and Monte Carlo iteration controls affect the scope of the algorithm used by a machine player; larger values make more challenging machine opponents. For two humans to play, click "reset", set the black player and white players to "human", and click "start".